1. 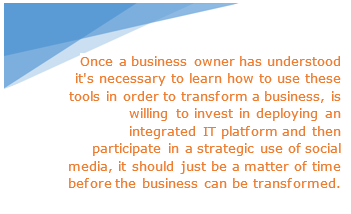 To be competitive in the market today a business must have a fully integrated information technology platform. For small businesses operating in mature markets oftentimes it's become a matter of survival - a daily grind to hang on to existing customers and eke out some profits. However, as will be discussed in this article, there are just two fundamental requirements for positioning a business for transformation. Secondly, a commitment to educational resources for learning modern digital marketing techniques. Successful accomplishment of these two requirements can position a business for growth and profits within its existing market. 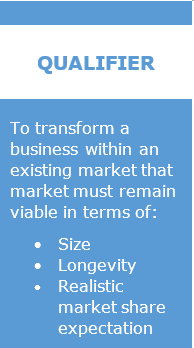 Typically business transformation may be considered by a small business owner as the act of transitioning out of one area of expertise into another and is usually contemplated because its original market has deteriorated or, for some reason it’s not considered possible for the enterprise to compete effectively in that market any longer. As a result, business owners contemplate the most risky of business transformations by attempting to enter into new markets and or new products. However, because it’s likely the business owners knowledge of the new products and markets are inferior to the knowledge and expertise for the original market, it's more likely that mistakes and misjudgments will occur. Before going down this risky path business operators in mature markets, where revenue is declining and profits eroded, should consider implementing a business transformation strategy within their existing market and area of expertise. If the qualifier conditions in the sidebar are met then it’s possible to significantly mitigate the risks of a business transformation by staying within its existing field of expertise in terms of products and customers. There are two foundational requirements to prepare for transforming a small business in order it can compete effectively with larger enterprises. product catalog and shopping cart. All of these software systems are available at reasonable cost and usually within subscription models so upfront out-of-pocket expense is modest. However, to be effective they must be deployed in order the different components “speak” to each other. For example, the back-office system used for invoicing and receivables & payables, etc. must “talk” to the CRM system with a full exchange of data taking place between the systems. The email campaigns must have their “clicks” recorded in the CRM system to manage the sales pipeline. The e-commerce shopping cart must “talk” to the back-office accounting system, etc. Making sure these systems are fully integrated requires the use of smart resources experienced in their field. Short-cuts are likely to backfire as failure to deploy an integrated platform means the effort to transform a business will be compromised. The business operator must learn how to use the technology platform particularly in terms of the front facing components such as the CRM, e-commerce and direct email campaign tools. Furthermore, as a vital part of the strategy also requires intelligent use of the popular social media platforms such as LinkedIn, Twitter and Facebook, then these have to be learned as well. Most small businesses are floundering when it comes to digital marketing, developing qualified inbound web-traffic and the use of social media to develop and expand an audience. For the most part these are new skills a small business owner has to learn and perfect in order to extract full value from the efforts but, in order for a transformation to take place, the new skills have to be learned. Spending time and money to upgrade and integrate an information technology platform and to be prepared to enter the world of social media and digital marketing will largely be a waste of money if the necessary skills and know-how are not developed to leverage the potential from the platform. There’s no shortage of options for any business owner looking for support on digital marketing and social media strategies. In fact, there are so many options that it’s become overwhelming causing great difficulty trying to figure out where to start. This, in turn, has paralyzed small business ownership social media strategy decision making, leading to low adoption rates for these key skills and strategies. Dabbling in social media and digital marketing isn't very effective so it's critical small business owners get their heads around the use of social media for marketing and to move forward with well-prepared strategies. However, to be effective, an inbound digital marketing strategy needs to be launched from within a fully integrated information technology platform. If this can be accomplished, and leadership stays the course with the strategy, then it should be just a matter of time before a full transformation can be successfully accomplished. For a comprehensive study on the path for a successful transformation strategy please download our free e-book by clicking on the button below.